Hurricane Maria strengthened to a category 3 storm as it headed toward the Caribbean, where it was forecast to hit the Leeward Islands on Monday night. Maria was “rapidly” intensifying into a major hurricane, the US National Hurricane Center (NHC) said. 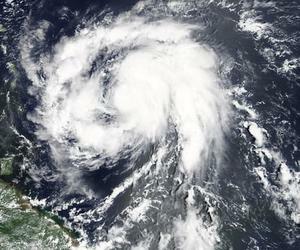 The storm’s center was about 60 miles (95km) east of Martinique, with maximum sustained winds of 120mph (195kph). The storm is on a path that would take it near many of the islands wrecked by Hurricane Irma and on towards Puerto Rico, the Dominican Republic and Haiti. Hurricane warnings were posted for Guadeloupe, Dominica, St Kitts, Nevis, Montserrat and Martinique.